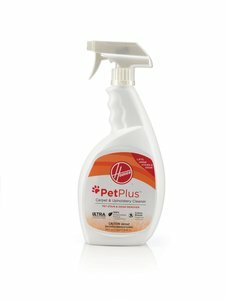 Hoover AH30610 PETPLUS Pet Stain&Odor Remover Spot Spray, 32 oz. The new proprietary advanced pet formula includes ingredients that penetrate deep into carpet fiber and eliminate the most stubborn pet stains and odors, and deter re-soiling! This heavy duty spot spray is ideal for spot cleaning on carpet and upholstery.